Today, it's taken for granted that fossils are the petrified remains of once-living animals. This idea has been around since antiquity, but from the days of ancient Greece right up to the eighteenth century it was in constant competition with an alternative theory: that fossils, although formed in the shape of living creatures, have never actually been alive themselves -- they've been made of stone right from the start. As with so many "wrong" ideas, this one appears to have originated with Aristotle, or at any rate it was popularized by him. 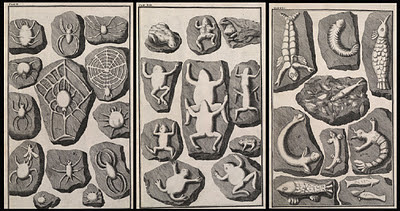 Aristotle believed that fossils were spontaneously created inside solid rock as the result of a natural creative force. Inevitably, when Aristotle's ideas were appropriated by the early Christians, this "natural creative force" was interpreted as God. One of the last and most enthusiastic proponents of this theory of fossil formation was Johann Beringer, a Professor at the University of Würzburg in Germany. 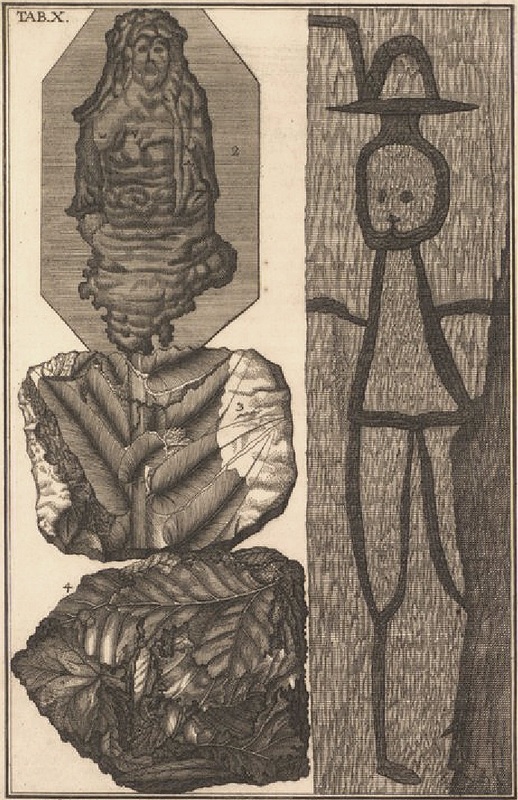 In 1726 he published a remarkable illustrated book, Lithographiæ Wirceburgensis, which can now be read online. You can skip the text (which is in Latin) -- the pictures at the end are the important thing. Beringer's fossils don't look like anyone else's, before or since. Here are just a few of them, depicting spiders on their webs, strange chimerical creatures and even frogs caught in the act of mating! Of course, Beringer was the victim of a hoax. The fossils were carved out of limestone by students of his, spurred on by a couple of rival professors that Beringer later took to court over the affair. It's said that Beringer tried to buy up all the existing copies of his book so he could destroy them... it's a good thing for Fortean posterity that he didn't succeed! One of Beringer's contemporaries was Johann Scheuchzer. 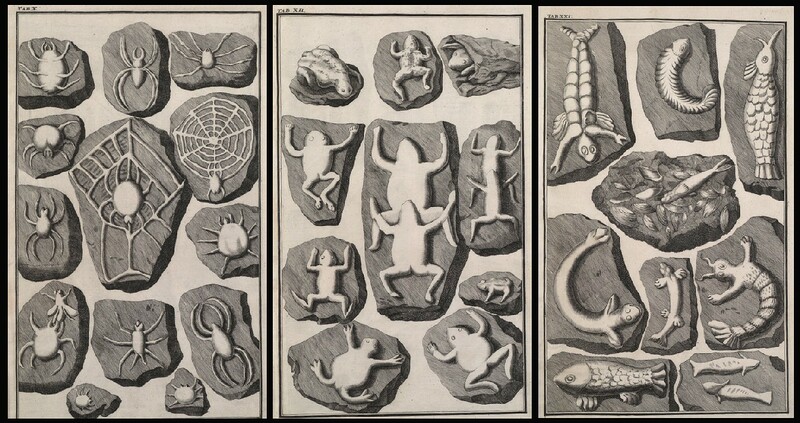 Unlike Beringer, Scheuchzer held the "correct" view that fossils were the remains of once-living life-forms... except that he believed they were all deposited during the Great Flood described in the Book of Genesis. Scheuchzer was particularly interested in fossil plants, and he wrote a book on the subject called Herbarium Diluvianum, published in 1723. Like Beringer's book, this is in Latin and can be read online. The picture on the left, taken from Scheuchzer's book, appears to show a couple of human simulacra seen in fossilized bark. As far as I can make out from the Latin text (or rather, from the garbled translation of it that I got out of Google), the simulacrum on the right has been embellished by a crude rustic hand using a paint-brush, whereas the one on the left is entirely the product of Nature. Of these two assertions, I can readily believe the first but I'm dubious about the second. I suspect the engraver has subtly "improved" the original... the 18th century equivalent of photoshopping!